Here are some fantastic community projects working with refugees in the region and further afield. Edge Hill staff and students volunteer with these groups in a range of roles. 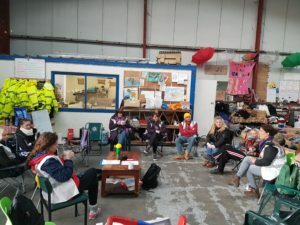 Skem International – working with West Lancs CVS, include a range of opportunities to support refugees placed in West Lancashire. 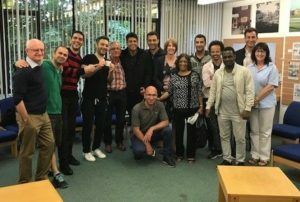 Everyone is welcome to come along to the weekly drop-in held at Skelmersdale Library on a Friday, 2.30-4.30pm, an informal session where you can meet some of the refugees currently living in West Lancashire. Help a non-native speaker to make sense of a form, maybe practice some English or just have a cup of tea, a chat and make refugees feel welcome. Buses run regularly from Ormskirk bus station to Skelmersdale Concourse, a short walk from the library, and there is ample parking available at the Concourse. Other activities include craft, shared meals, ESOL classes and gardening. For more info see the Skem International facebook page. Care4Calais have many opportunities to donate and volunteer to support refugees living rough in the Calais area. making donations, fundraising and by spending time working with C4C in northern France. All have reported on the value of being able to do something positive to help. Hello Preston! runs a family learning project every Monday evening 6-8 o’clock at UCLan in Preston city centre. We follow a self-designed curriculum that is fun, interactive and optimises people’s opportunity to practice speaking English with a number of regular volunteers passionate about helping refugees. This part of the year, it was about JOBS: giving a self-introduction, recognising different skills, applying and interview techniques. Experienced and passionate volunteers including an early-years practitioner, teacher and a librarian lead a well-run playgroup alongside this. We give children the opportunity to improve their reading and writing skills whilst helping with homework research skills. Younger children are read to and take part in art and craft activities. Children range from babies to teenagers, usually up to fifteen in total. If you’d like to contribute or take part in any way, please contact Ruth or Jen. We have volunteers who attend weekly or fortnightly. If you have any questions about different roles, please contact Emma, the Development Officer or speak to her when you come into the centre. If you know of a project looking for volunteers, please email A4P@edgehill.ac.uk and we will include them here.